Among the more than 31,000 postal retail operations currently active across the U.S., the downtown post office in Texarkana is definitely among the most unique post offices. It makes for a nice, quick visit if you find yourself along this part of I-30. Texas became the 48th state into which I set foot, on August 5, 2012. 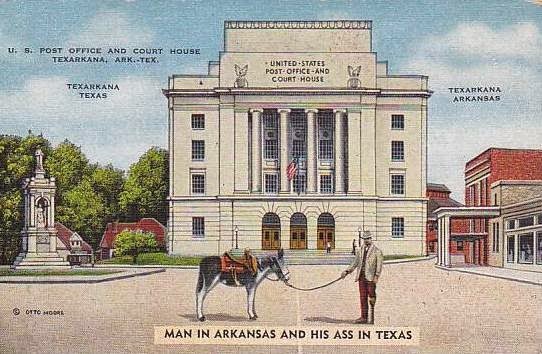 It was the first time I'd first set foot into a state on Federal/postal property: the Downtown Station post office of Texarkana—the city that's "Twice as Nice," if you believe the water tower off I-30—is perfectly bisected by the Arkansas/Texas state line. The state line is appropriately marked by State Line Avenue, along which northbound traffic is in Arkansas and southbound traffic is in Texas. This means that the photo below was the effective result of a jaywalking misdemeanor I was able to commit in two states at once. Not that anyone cared—only one car passed me that sweltering [95°] Sunday afternoon, and the driver shrugged off my daring photo op maneuver as old hat. Let's show you a map and the building in question. This federal building is indeed the only one of its kind that physically straddles two states, and it serves as a Federal Courthouse as well. As it turns out its location makes things a bit tricky. You see, the Constitution's Sixth Amendment dictates that "the accused shall enjoy the right to a speedy and public trial, by an impartial jury of the state and district wherein the crime shall have been committed." Meaning, if you commit a crime in Arkansas, you must be tried by a jury of your Arkansas peers. You'd also have to be tried in Arkansas. Similarly in Texas. So what's the architect behind a federal courthouse in Texarkana to do? Well, you could build two distinct courthouses, one on each side of the state line, or you could save the government a whole lot of money by just constructing one courthouse, physically along the state line. Inside the building, the courtrooms for the U.S. District Court for the Eastern District of Texas lay within the western side of the building fully within Texas; while courtrooms for the U.S. District Court for the Western District of Arkansas are fully within Arkansas. Savvy, no? The United States Courts website thoroughly discusses the nuances of this situation. A historic marker at the building reads: "Each state [Arkansas and Texas] had separate post offices until 1892," at which point the first joint post office was constructed on the state line. That building was demolished in 1930, and the present structure, constructed on the same site, was completed in 1933. "The base is of Texas pink granite while walls are of limestone from Arkansas," the marker continues. Inside the postal lobby (according to my sources; alas, the lobby is locked on Sundays), the postal retail counter is located on the Texas side of the state line, while PO Boxes (with separate sections for Texas and Arkansas box mail) are located on the Arkansas side of the line. 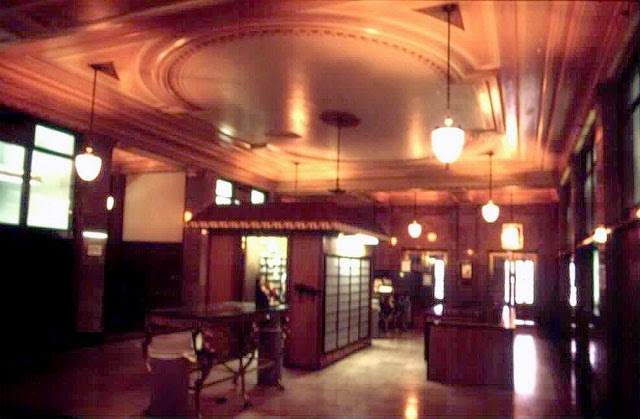 According to the General Services Administration (or GSA, which operates the building and runs this thorough webpage describing the architecture and renovations of the building): Although the postal lobby, located immediately beyond the first floor elevator lobby, has undergone repeated modifications since construction, including the introduction of an inappropriate post office box "hut" and customer corral, it retains much of its original character. From the looks of it one might need to pass through security to enter the postal lobby. It is possible that packages being mailed at the facility must be scanned by security, as is the case at Providence, Rhode Island's downtown Annex Station post office, which also houses federal court facilities. There are other notes of postal interest as well. For example, the postal management center (District) responsible for the operations in Texarkana—Texas and Arkansas, is based in Dallas. 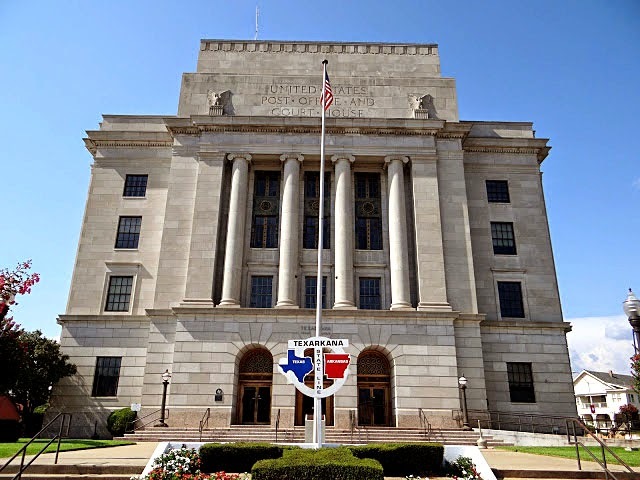 USPS's Dallas District is responsible for the operations for every ZIP code in [northeastern] Texas beginning with '75', and only those ZIP codes, except that it also oversees operations within the 71854 ZIP code for Texarkana, Arkansas. Every other ZIP code in Arkansas is subservient to USPS's Arkansas District. 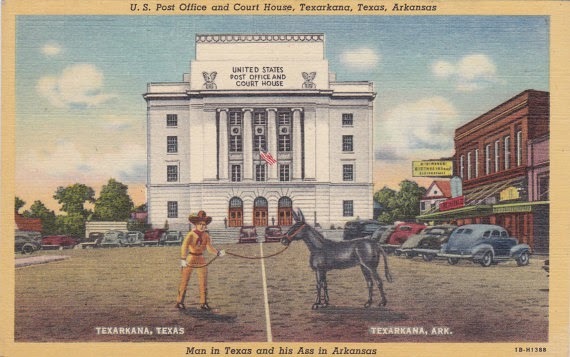 I think it's interesting to see how Texarkana plays out in the postmark arena. There are just a handful of analogous administrative crossover instances in the country, most of which involve communities in Appalachia, including: Bristol, TN/VA (whose three Tennessee ZIP codes are not managed by the USPS's Tennessee District, as one would expect, but rather by the neighboring Appalachian District); South Williamson, KY 41503 (managed by Appalachian instead of the expected Kentuckiana, based on its ZIP code); and South Fulton, Tennessee 38257 (Kentuckiana instead of Tennessee). In a similar vein, Fishers Island is the only community in New York that has a Connecticut ZIP code, 06390, owing to the fact that the Fishers Island ferry that carries the town's mail is based in Connecticut. But that's another post. Texarkana's [now-]downtown post office served as a regional mail processing hub until its operations were moved into a rather generic building on the Texas side of town in 1971. 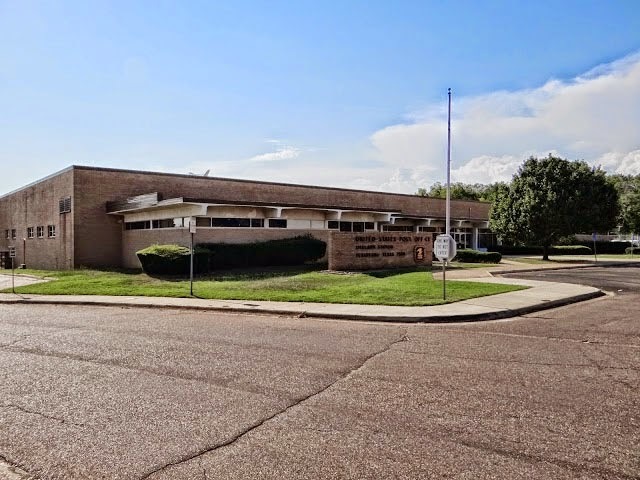 The building's address is 2211 N. Robison Rd., 75501. As a result of USPS's Area Mail Processing program both originating (to-be-cancelled) and destinating (to-be-delivered) Texarkana mail now gets processed in Shreveport, Louisiana, 70 miles away. Postmark scans used in this entry were kindly provided by Kelvin Kindahl from his personal collection.